The Giants (Ryan & Tim McElrath) went a perfect 6-0 at Wiffle Bash to win the tournament title. At 3:00 AM early Saturday morning – a time and day when most are either fast asleep or still going strong from the night before – Tim and Ryan McElrath woke up and hit the road on a 250-mile trek from their home in Kingston, New York to York, Pennsylvania. Their destination? Shi Wiffleball Park, the site of Mid Atlantic Wiffle’s Wiffle Bash tournament. For the brothers, the cost of enduring a long car ride at such an ungodly hour was worth it for the opportunity that lay ahead. Competing almost exclusively in Palisades WBL for much of this decade, Tim and Ryan have established themselves as two of the premiere players in what is currently the country’s premiere league. Despite their significant accomplishments in Palisades, the McElraths have felt overlooked in discussions of the game’s best teams and players. 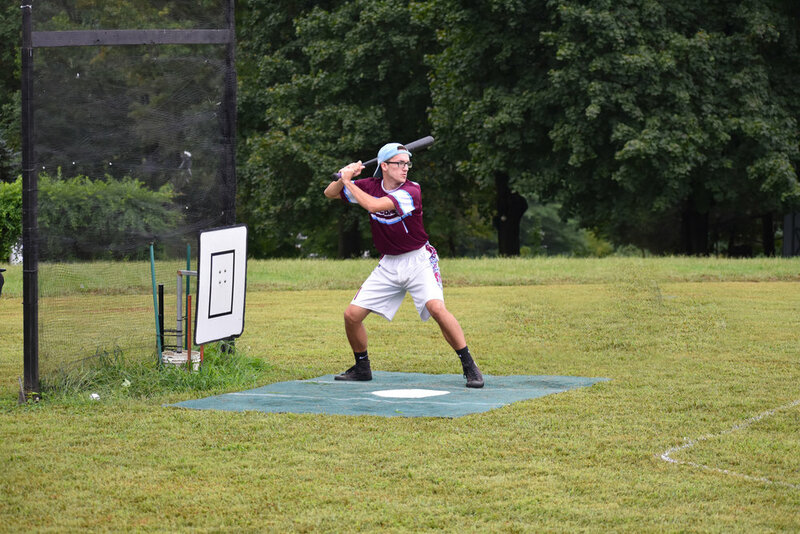 Competing at Wiffle Bash provided an opportunity to prove themselves against high calibre competition in a tournament setting outside of their home base. “We kinda had to make a statement,” Tim wrote on Sunday, addressing his team’s motivation after the fact. Saddled with one of the more difficult pool play schedules in the field, the Giants went a perfect 4-0 during that portion of the schedule. It was far from a cake walk, however. The Giants were tested early and often throughout pool play. In what is becoming somewhat of a trend in MAW tournaments, the first game of the day – when players on both sides are completely fresh – nearly became a trap game for one of the tournament favorites. In this situation it was the upstart Jersey Lemon Heads who threatened to throw a wrench into the Giants’ tournaments plans. The Lemon Heads picked up a couple of early opposite field hits against Tim McElrath while the Lemon Heads’ ace, Ray Lutick, kept the Giants’ bats in check. The game made it through five innings with no score and a total base deadlock. In the 6th, the Giants broke the total base stalemate to squeak by with a narrow but important early tournament win. The Giants were still trying to find their groove – or perhaps were still feeling the effects of their early wake up call – when they met G€M on Buffalo field for their second game of the day. Ben Stant sawed through his former Palisades teammates in the early going, striking out nine of the first ten batters he faced with a one out walk to Tim in the third blemishing an otherwise perfect record. In the bottom half of the third Stant hit a solo home run off Tim, who was already on his ninth inning of work before 11:00 AM. Having failed to score a single run all morning and now with a one run deficit to make up, things looked grim for the McElrath brothers. Like many great teams, however, the Giants do some their best work with their backs against the wall. Ryan led off the top of the fourth inning with a single and Tim immediately cashed in with a two-run bomb to left field. Following back-to-back strikeouts that got Stant within one out of escaping with limited damage, the McElrath’s went on one of their patented hitting tears. The brothers used four straight singles and one walk to get across two huge insurance runs. In the bottom of the fourth, G€M threatened when John Magee and Stant reached to start the inning. This forced the Giants to summon Ryan into the game to close things out. The 2017 Palisades MVP and Cy Young award winner quickly shut the door to end the game and propel his team to a 2-0 start. The fourth inning of the G€M game seemed to jumpstart the Giants for the remainder of pool play. They made quick work of Nick Shirey’s Wyld Stallyns team and then jumped over Jarod Bull early and often on their way to a 6-0 victory over the Yaks. The way the Giants made relatively easy work of the Yaks sent a clear message that they were going to be difficult to stop. As the Stompers’ Nick Schaefer mentioned on commentary for the Facebook Live stream of the game, Bull pitched a far better game then his lopsided line would indicate. The McElrath’s bats, however, were just too much to handle. It wouldn’t be the last time in the tournament that the brothers blindsided a top tier pitcher with their relentless offensive attack. At 4-0, the Giants locked up the top seed in the four-team single elimination round. The Giants were joined by – in order – the Lemon Heads, Stompers, and My Name is ERL, making the fourth seeded ERL their first-round opponent. In a stark contrast from what we are used to seeing from ERL, Connor Young made it through pool play with an [almost] fresh arm. ERL – one of the few regular teams out there that can boast having two left-handed pitchers – got two games apiece out of their southpaws on Saturday. Joe Schlindwein picked up his first MAW win while Blake Hoffman carried the heavier load against the Yaks and Stompers, winning one and taking a hard luck loss in the other. With his arm rested and ready to go for the semi’s, Young rolled the dice with a two-man, Giants-inspired lineup consisting of Joe and himself. The potential benefit to that configuration – which the McElraths enjoyed all tournament long – is getting to see the pitcher more often and quickly learn his tendencies. The downside was the loss of extra fielders on defense, but Soup felt confident that he could limit the number of balls the Giants put into play to mitigate the absence of a third defender. For the first few innings, Young’s plan looked genius. Coming up to the plate for the third time in just 1 1/3 innings, Soup deposited a ball over the 105-foot mark in straight away center on Sheff. The solo shot gave ERL an early advantage that looked as if it was going to stand up. Young kept the first ten batters he faced off the bases while recording eight of his first ten outs on strikeouts. Of course, nothing is ever over with the Giants, who are always just one plate appearance away from flipping any game on its head. In the semi-finals that moment came with one out in the 4th inning. Ryan McElrath – seeing Connor for the sixth time in about twenty minutes – returned the favor from earlier with a solo shot of his own. To his credit, Soup did not allow the Giants to go on an immediate charge right after the big hit. Young escaped of the inning with two straight K’s to limit the damage. Sitting in on commentary for the finals later in the day, Connor spoke to feeling that he only delayed the inevitable by working out of the fourth inning. It was a feeling that only grew stronger when Joe booted a ground ball with one out in the 5th. Sure enough, that error opened the floodgates and the McElraths belted out four straight singles to end the game and ERL’s tournament. Awaiting the Giants in the finals were the familiar faces of the Stompers. For the third time in four tournaments, the Stompers found themselves in the tournament title game. They handed the ball to Jordan Robles, who was coming off an all strike out perfect game against the Lemon Heads in the semi-finals. Robles entered the tournament with a rare several-week break from fast pitch competition and the benefit of his rested arm had been evident all tournament long. His stuff was sharp and he maintained his effectiveness late into the day despite being forced into action earlier in the tournament than anticipated. The on-field familiarity between Robles and the McElraths only added to the intrigue of the day’s final game. The game was scoreless through the first 1 ½ innings, but it was evident that would not last long. The Stompers picked up one double in each of the first two frames courtesy of Sarno and Robles, respectively. For their part, the Giants took strong cuts against Jordan in the first. Based on the early quality at bats from players on both sides, it was only a matter of time before someone broke through. That breakthrough came in the second inning, in a major way. All day long it seemed that once the Giants picked up one hit, a half dozen more followed. When Ryan opened the second inning with a single and Tim followed up with one of his own, you could already sense that Robles and the Stompers were in trouble. 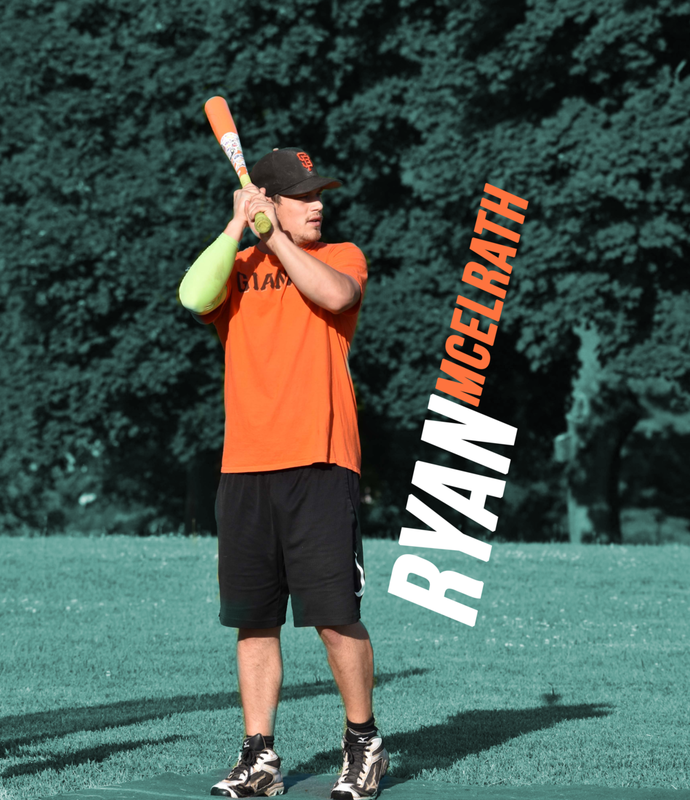 Like clockwork, Ryan homered in his next at bat – a prodigious shot that landed well into the trees overlooking Sheff field – putting the Giants ahead 3-0. The McElraths were not done yet – not by a long shot. Tim got his team started all over again with a single, Ryan added a double, and then Tim clobbered a pitch for the Giants’ second 3-run blast of the inning. In total, the Giants pounded out six straight hits – including a pair of home runs – before a single out was recorded in the second inning. The offensive fireworks seemed to stun all the players still in attendance, who are not used to seeing Robles hit around in such a manner. Jordan – in a testament to his own abilities and makeup – found a way to keep the Giants off the scoreboard the rest of the tournament, largely by serving the McElraths a healthy dose of change ups. Unfortunately for the Stompers, the damage had already been done. Jordan – who had as much success as anyone against Ryan on the day (3 walks, triple, home run) – broke up the shutout with a one out home run in the fifth. The Stompers picked up another run later in the inning thanks to a Sarno double and a Nick Schaefer RBI single, but Ryan snuffed out the attempted comeback by striking out the next batter to end the game. The Giants grew stronger and stronger as the day went on and finished with a perfect 6-0 record. For their efforts, they took home the $540 first place cash prize. Even more importantly, the brothers left York having made the statement they set out to make. There is no doubt – not as if there should have been before – that the McElraths are two of the best players in the entire game and a force to be reckon with whenever and wherever they step on the field. 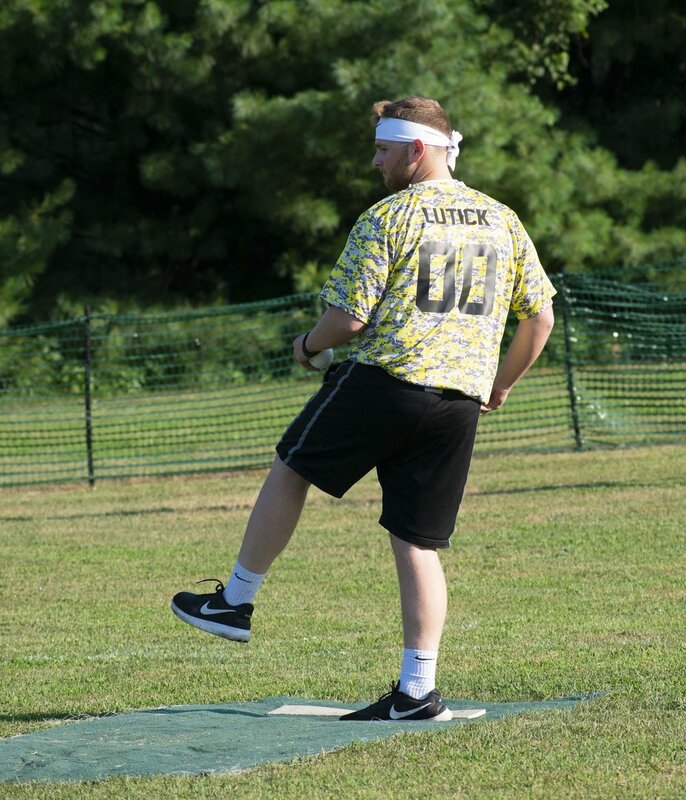 Ray Lutick (Lemon Heads) worked every inning for his and allowed just two runs at Wiffle Bash. 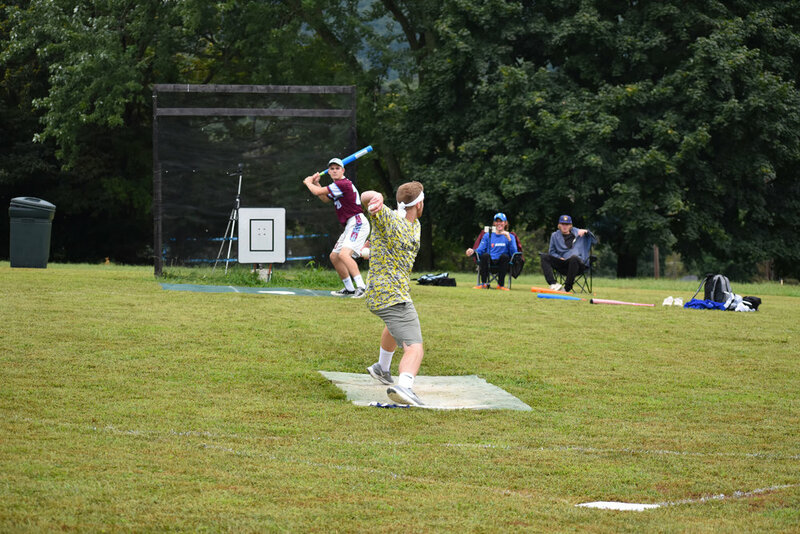 It would have been nearly impossible for any player to outdo the individual performances of Ryan and Tim McElrath at Wiffle Bash, but the Jersey Lemon Heads’ Ray Lutick came awfully close. The power right-hander mowed down opposing hitters all-tournament long, starting with six scoreless innings against the Giants in his team’s first game. Lutick allowed just two runs the entire day – solo shots to the Stompers’ Sarno and the Barrel Bruisers’ Tony Manelli – while pitching every inning for this team. Ray showed plus velocity and was able to maintain it throughout the tournament. His already strong velocity played up a little bit more thanks to a compact overhand delivery. He relied heavily on a hard overhand drop pitch that resembled a power baseball sinker more than a traditional Wiffle Ball dropper. Only occasionally did Lutick break out the side arm riser that he used liberally in his first MAW tournament last summer. If he can find a complimentary pitch and keep his arm in one piece, Lutick has the chance to be a special pitcher. Behind Ray, the other Lemon Heads fielded well and had strong at bats throughout the tournament. The Lemon Heads’ offense should improve rapidly with additional tournament experience. On the carpet, they already have a bona fide ace in Lutick but the addition of another pitcher might become a necessity at some point. A 3-2 record against the calibre of competition the Lemon Heads faced at Wiffle Bash is incredibly impressive. Perhaps even more indicative of this team’s bright future is that they were in no way satisfied with their fourth-place finish. These guys are hungry for success and have the talent necessary to get where they ultimately want to be. Jordan Robles (Stompers) entered in relief against My Name is ERL in the 7th inning and finally closed out the marathon game in the 8th. Mid Atlantic has not lacked for memorable championship games during its limited existence. From Nick Schaefer outdueling Ryan Doeppel in the very first MAW tournament last April to the 10-inning classic between ERL and Cloud9 this June, the final game of the tournament is often also the best of the tournament. At Wiffle Bash, however, the tournament’s best game occurred much earlier in the day. 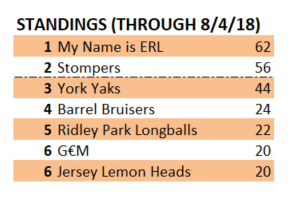 For the third time this season and the sixth time overall, the Stompers and My Name is ERL met in an MAW tournament. The Stompers entered the day leading the all time series 3-2, but both clubs have undergone drastic changes since their three 2017 meetings. A better gauge of the current rivalry would be the games ERL and the Stompers played in April and May of this year. The former saw the Stompers eek out a 1-0 victory behind their newest addition, Chris Sarno, while the latter game was taken 1-0 by ERL thanks to a dominant pitching effort from the debuting Dan Whitener. The talent gap between the teams is razor thin which almost guarantees a nail-bitter every time out. The game – as expected – was a scoreless pitching duel through the first three frames. Blake Hoffman – facing the Stompers for the first time – pitched a perfect top half of the fourth while Sarno stumbled some in the bottom half for the Stompers. The Stompers’ hard throwing right-hander walked Young to open the inning and allowed an unlucky one out single on a playable groundball to Tim Cooke. Although Sarno got out of the inning without allowing either runner to score, the base runners were significant because they put ERL ahead on total bases by a count of four to three. The Stompers needed a base runner to stay alive, which they got right off the bat thanks to a Robles’ walk. Cooke then redeemed himself with a double off Jim Linhart’s hands to give his team a two base advantage. Thus began a four inning stretch where the Stompers got at least one runner on base every single inning only for ERL to answer right back in innings five, six, and seven. After Paul Cooke walked in the 7th to put the Stompers up by one base, Jordan Robles asked for – or perhaps more accurately, took – the ball from Sarno to try to close out the game. He almost did just that, until Young – one of the more clutch hitters in all of Wiffle Ball – delivered with a two out single right back up the middle. In the 8th, Sarno delivered a double off of Hoffman to put the Stompers ahead by two bases. The second time was the charm for Robles, who worked around a two out walk in the bottom of the 8th inning to put the Stompers in the win column. It is not often that a 0-0 game could be described as exciting or epic, but this one might just fit the bill. The total base lead changed hands six times and was tied four different times. There was no room for error on either side – which first became apparent in the third inning – and that lent even more importance to every hit, ground ball, and taken pitch. Look for a full, edited version of the game to hit the Video on Demand section of the MAW website in the near future. Bent Stant (G€M) delivers a pitch as teammate Marcus Lee looks on. The Stompers championship game loss to the Giants was their first loss of the season on Sheff Field. The team’s prior three defeats this year all occurred on Buffalo . . . Where’s the run support? 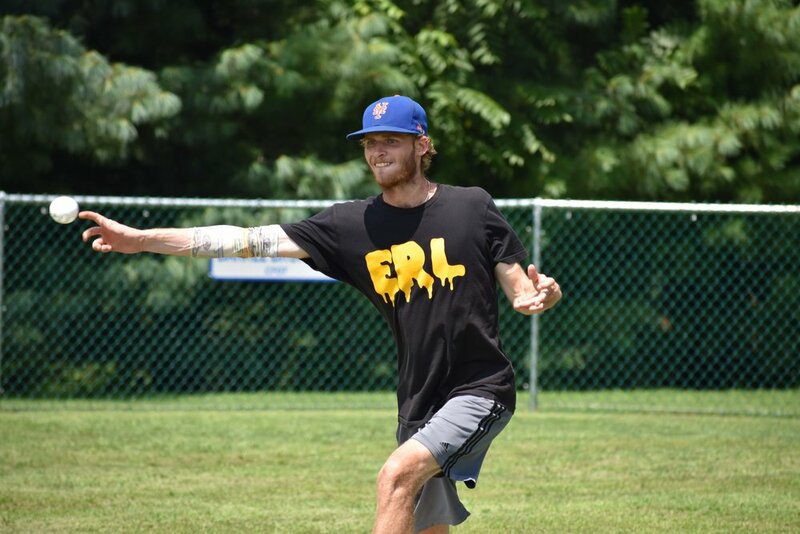 ERL’s Blake Hoffman threw 13 innings over two games, struck out 32 batters, allowed no runs, and served up just three hits but came away with only one total base win to go with one total base loss . . . Last summer, Connor Young became the first MAW pitcher to strikeout 200 batters in a season (including the Championship Tournament) when he set the single season record at 213. After Saturday, Chris Sarno is sitting on 142 strikeouts for the season. Red is not expected to be in action on August 4th, which may hurt his pursuit of both the 200 K mark and Soup’s record . . . The closer role has not taken hold in competitive Wiffle Ball the same way it has in baseball. 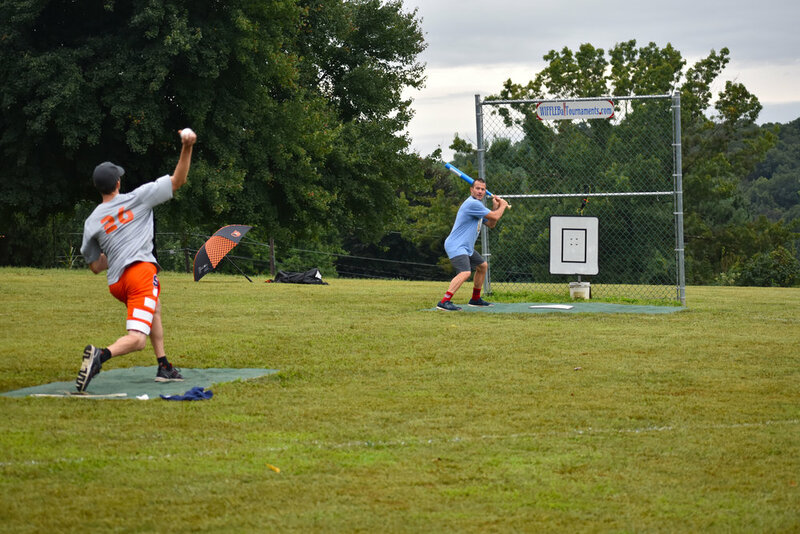 At Wiffle Bash, however, there were two instances of teams turning to their ace to finish off games. Both the Stompers (Robles against ERL) and the Giants (Ryan McElrath against G€M) switched pitchers late in games to close the door on a victory . . . When asked if he ever remembers throwing that many change ups in a game as he did against the Giants, Robles shook his head 'no'. "I had to try something to get them out," the 2017 MAW post-season MVP conceded . . . Has a new player entered the Mid Atlantic MVP conversation? Bent Stant has played in just two of the four tournaments so far this season but is nonetheless among the leaders in most hitting and pitching categories. Will the voters overlook his relatively minimal playing time to reward him for what have been clear MVP-level performances when he's been on the field? . . . 500 miles away from Wiffle Bash, a pair of leagues with MAW ties fared well at the NWLA Tournament. Ridley Park stumbled going 0-2 in the elimination round but rebounded to win the weekend’s consolation tournament while also representing well in Friday night’s All-Star game and home run derby. Wiff is Life League started the weekend strong with Jordan Castelli winning All-Star game MVP honors and finished even stronger, outlasting the 16-team field on their way to capturing the tournament championship. Congratulations to both leagues on their achievements and we look forward to seeing both groups very soon . . . The Jersey Lemon Heads hope to continue the “trend” of MAW affiliated teams faring well in outside tournaments when they travel to Tennessee to play in an eight-team tournament this weekend. Based on what we saw at Wiffle Bash, it would not surprise anyone to see the Lemon Heads make a deep run . . . MAW officials continued the slow process of integrating an interview area and process into the York tournament experience. Look for some of the pre-tournament interviews recorded at Wiffle Bash on the website . . . Adding to the great tournament experience this past Saturday was the Barrel Bruisers kind generosity in supplying and grilling hot dogs and hamburgers for every player. Thanks Jerry, Chris and Tony! The York Yaks - currently third in the standings - have a spot in the Championship Tournament all but locked down (L:R Jared Laird, Adam Milsted). With just two tournaments left to be played, the Championship Tournament race is heating up. The top three spots are set in stone, although ERL is well within striking distance of the Stompers for the top seed. G€M and the Barrel Bruisers have a strong grip on two of the final three sports, although there are several teams that could still overtake them. The auto qualifier spot for the Canonsburg Classic looms as a complete wild card at this point. There is no guarantee that a team outside the top six will win the tournament - or that the winners will be able to accept the bid - which means that six spots based on total points could still potentialy be up for grabs. For teams like the Lemon Heads or Longballs Red, a Championship Tournament spot could very well be in their sights with one more strong finish, regardless of the outcome in Canonsburg. MAW officials have passed along the latest payout projections for the Championship Tournament. Based on current projections, the first place grand prize is estimated to be $2,000 with an anticipated purse of $500 to be split among the top three runners up. * If your team is on the bubble, now is the chance to make a move and ensure your chance to play for big money on September 8th! My Name is ERL (NJ) 46 pts. York Yaks (PA) 32 pts. Barrel Bruisers (VA) 18 pts. * Assuming a six team Championship Tournament field. ** Cloud9 (16) and Ridley Park Longballs (8) are currently ineligible for the Championship Tournament as members of these played for points on different teams in subsequent tournaments (Giants and Longballs Red, respectively). It is hard to believe, but we are already on the home stretch of the 2018 summer season! 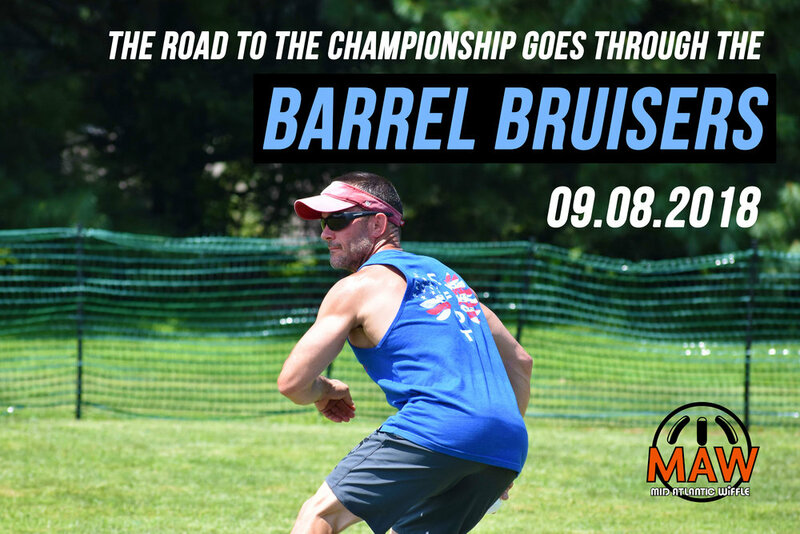 There are just TWO open entry tournaments left to go, beginning with Backyard Brawl on August 4th at Shi Wiffleball Park in York. This tournament is shaping up to be wide open with some MAW regulars either not expected to compete or expected to compete with short-handed rosters. There are a couple of spots still open and with Championship Tournament slots still up for grabs, this is an excellent opportunity for several teams to make a late run at the post-season. Two weeks later, MAW rolls into Canonsburg, Pennsylvania, home of the NWLA Tournament champions Wiff is Life League! In partnership with WILL, the Canonsburg Classic will be an MAW style tournament complete with a first place cash prize. 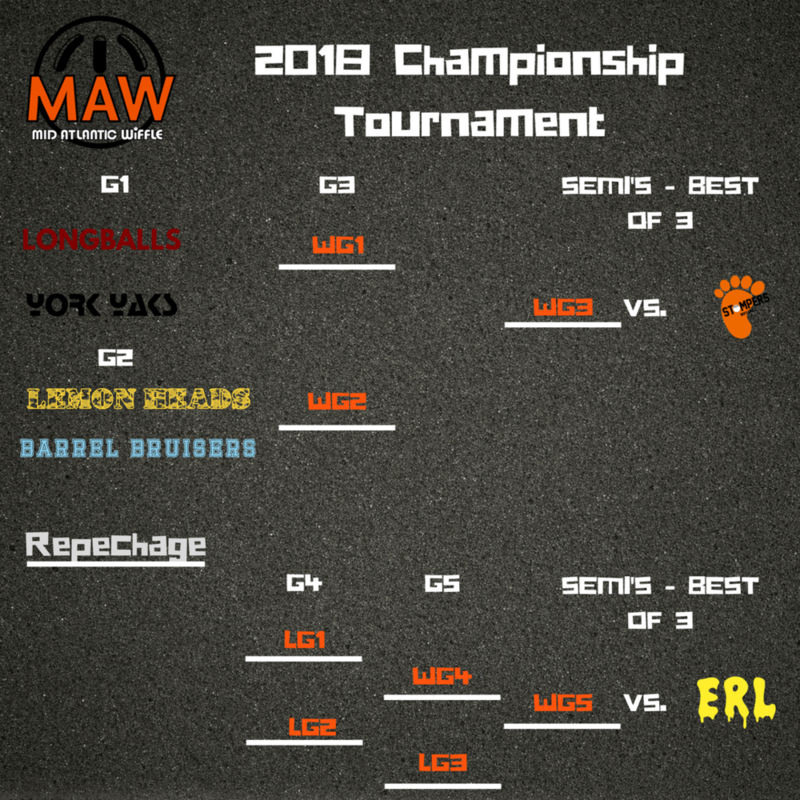 In addition, participating teams will receive points towards the Championship Tournament and the winning team will receive an automatic bid to the MAW Championship Tournament on September 8th. The Canonsburg Classic is expected to include a mix of MAW regulars, WILL regulars, newcomers, and more! Register today to take advantage of what promises to be a unique and exciting tournament. The Yaks' Adam Milsted (left) and Jarod Bull (right) will be on the field together for the first time this season at Wiffle Bash. 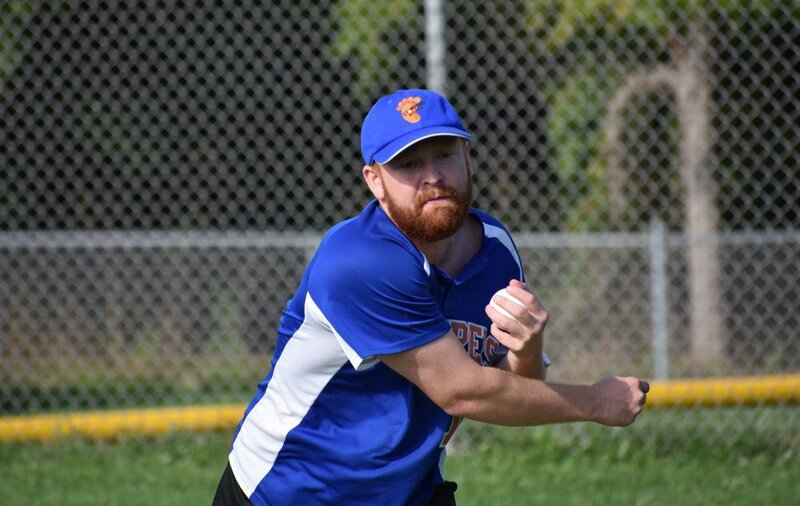 When the York Yaks added veteran Adam Milsted to their roster over the winter, they envisioned a one-two punch of Milsted and Jarod Bull pitching them deep into the day tournament after tournament. And perhaps that is exactly what would have happened, if only the Yaks could get their top two starters out on the field at the same time. In April at Opening Day, Milsted played with his non-MAW team – Way Too Beautiful – while Bull was available to the Yaks for only 1 ½ games due to prior commitments. In May, Milsted made his long awaited Yaks’ debut while Bull sat out to nurse a sore shoulder. Bull was back on the mound for the June tournament but this time it was Milsted who was absent thanks to an outside commitment. Now at long last, both Milsted and Bull are expected to toe the rubber for the Yaks in the same tournament at MAW Wiffle Bash. Just how significant is it for the Yaks to have their top two pitchers available in the same tournament? MIlsted and Bull have combined for a 1.66 ERA in 29 innings pitched for the Yaks this year while all other Yaks pitchers have pitched to a 9.77 ERA in 17 2/3 IP. If that duo puts up similar numbers on the 14th, the Yaks have an inside track to the final four. Another team thrilled to be back at (near) full strength is the Barrel Bruisers. Jerry Hill was left to go at it (almost) alone back in June and performed admirably, winning one game and dropping a close one to the WILL Waves by a score of 2-1. Jerry won’t have to shoulder nearly as much of the workload this Saturday as the Bruisers will have team ace Chris Owen back in the fold. Last time we saw Chris, he turned in his best single tournament in Mid Atlantic by holding the Yaks and My Name is ERL to two runs over eight innings at Torneo de Wiffs in May. The Bruisers are on a mission for playoff points as they look to solidify a spot in September’s Championship Tournament. A .500 pool play record will be a big step in the right direction. To get there, the Bruisers must find a way to pick up a one win in one of their three non-InHumans games. 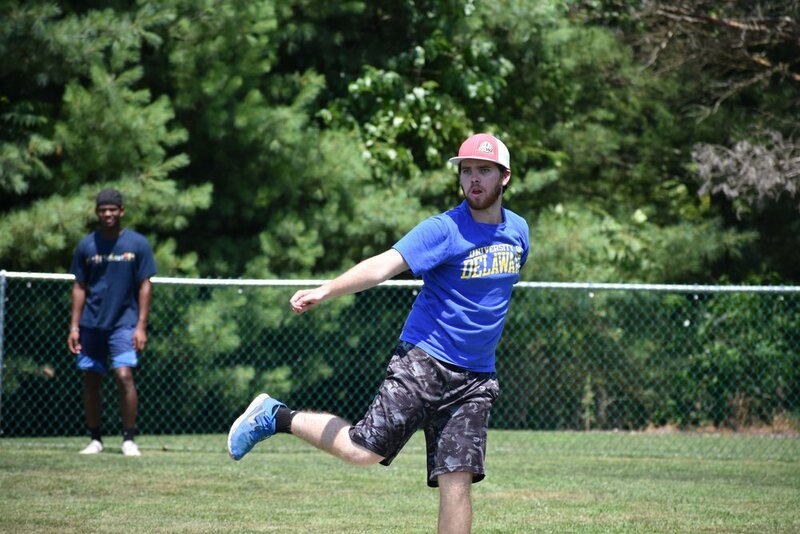 Like Owen, ERL’s Blake Hoffman is making his return to action after missing Wiffle Wars in June. Blake is itching to get back on the carpet and continue his rookie campaign after taking a month off. The question is, how much will we see of him on the rubber this weekend? For a variety of reasons, the left-hander has been used sparingly thus far. In April, Blake worked one round robin game after ERL had already been eliminated from contention and in May his only start was a loss in the semi-finals. For those two tournaments, ERL captain Connor Young chose to hold his rookie pitcher back for the games later in the day. Soup might not have the same luxury this time around, not with Dan Whitener reportedly done for the rest of the summer due to collegiate baseball commitments. Is this the tournament where we finally see what one of the game’s most promising young hurlers can do over multiple appearances? After using a stripped down three-man lineup in June, ERL will be carrying five on Saturday. Young and Gerard Fitzgerald form a potent combination in the middle of ERL’s lineup. While Owen and Hoffman are making their returns after a one-tournament layoff, it has been even longer since we last saw Ben Stant and the boys from G€M. On Opening Day back in April, Stant guided his inexperienced but talented squad to a final four appearance. G€M ended their impressive debut tournament with a heartbreaking 4-3 loss to The Naturals in the semi’s. The team was led by their talented captain – Stant - who picked up wins against the Yaks and Cuban Raft Riders in pool play while also hitting three home runs. G€M has drawn arguably the toughest pool play schedule in the field with games versus the Giants, Yaks, Stompers, and Barrel Bruisers. To compound matters, Ben is scheduled to pitch in GSWL Yard League the very next day and may want to control his innings on Saturday. Look for G€M to try and steal a win early in the day against the Giants or Yaks, turn to another pitcher to try to get past the Bruisers (as they did with John Magee back in April) and see if they can’t work themselves into the elimination round without overtaxing their captain’s talented right arm. G€M’s early day meeting with The Giants promises to be one of the highlights of the morning from a pure competition standpoint. The matchup also comes with a little bit of history. Stant was briefly part of the 2017 Giants squad that won the Palisades WBL championship. In one weekend worth of action for the Giants, Stant fared well. He reached base in 4 out of 11 plate appearances and struck out 14 batters during a 5-inning 1-0 loss. Stant suited up for the Giants again, but did not see any additional game time for the eventual Palisades champs. This winter, the Giants unloaded him in a trade with the Expos. While there are not necessarily any hard feelings, Ben will nonetheless have an opportunity this Saturday to show the Giants what they missed out on. Left to Right: Ryan and Tim McElrath after winning the 2018 MAW Winter Classic in February. Among teams looking to play spoiler are a pair of local squads– the Wyld Stallyns and those loveable underdogs, the InHumans. The InHumans are still in search of that allusive first win. Their best chance to do so on Saturday would appear to be against the Stallyns in a late pool play meeting, although even that won’t be easy. The Stallyns are captained by Nick Shirey who – as he is want to do – will temporarily split from the Yaks for a chance to pitch. Shirey will be joined by J.R. from Bacchus and a third player making his MAW debut. While the realistic best-case scenario for the InHumans and Stallyns is to play the role of spoiler on Saturday, this next team is staring at a higher ceiling. 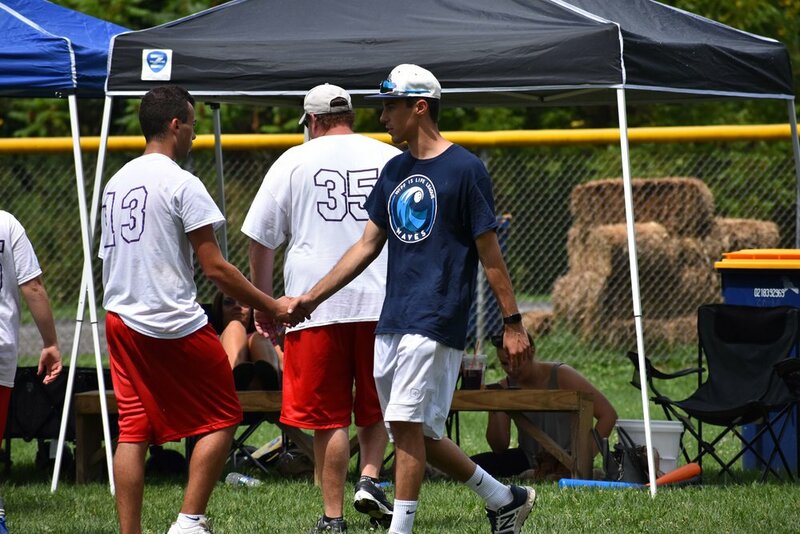 Last August, an unknown team from the Jackson Wiffleball League arrived in York for the fourth tournament of the season. In their first game the newcomers upset an undermanned Stompers squad and then dropped a pair of close games to My Name is ERL on the way to a top four finish. Sporting a new team name – Jersey Lemon Heads – the guys are back and looking to build off of their sold debut of a year ago. These Jersey boys have a manageable schedule and a real chance to be alive late in the day. If you want a player from Lemon Heads to watch, keep an eye on Ray Lutick. The pitcher impressed fellow players last August with a side arm riser that – when he keeps it out of the middle of the plate – rates as an above average offering. Finally, there's the Stompers. The team’s impressive streak of tournament titles – four straight – came to an end in June at Wiffle Wars. While a semi-final loss to one of the game’s best pitchers hardly qualifies as disappointing, there is a sense that the club is eager to “bounce back” after missing out on the finals in June. The Stompers will have all three of their pitchers – Jordan Robles, Chris Sarno, and Nick Schaefer – available once again, although it will likely be the last time that happens this (regular) season. As usual, that wealth of pitching depth gives team captain Tim Cooke much to ponder. The Stompers’ pool play matchup with My Name is ERL will be another chapter in a classic MAW on-field rivalry. The Stompers lead the all-time series three games to two. The Mid Atlantic Wiffle Facebook page (www.facebook.com/midatlanticwiffle) will once again stream several games throughout the tournament. All game times are subject to change, so we suggest checking in twenty minutes or so early to make sure you don’t miss any of the action. Live commentary from a rotating cast of players will be provided when possible. As always, follow MAW on Twitter (@midatlanticwiff) and on Instagram (midatlanticwiffle) for updates throughout the tournament. Check back next week after the tournament for full coverage including the tournament recap, video highlights, and much more.